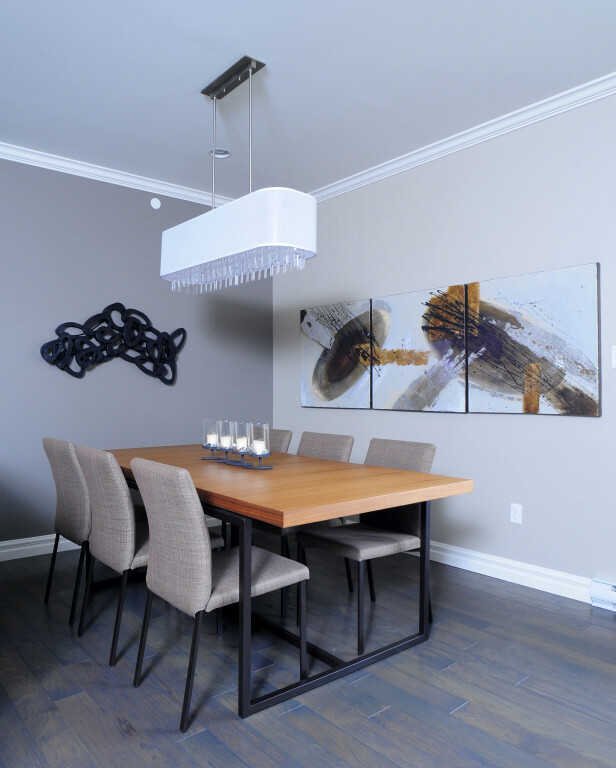 Wood tones are often problematic when you choose a colour scheme or new furnishings. Some people are willing to solve the problem by spending hours looking for furniture with the same wood tones. After all that work you may end up with a boring room where everything looks the same and blends into each other. 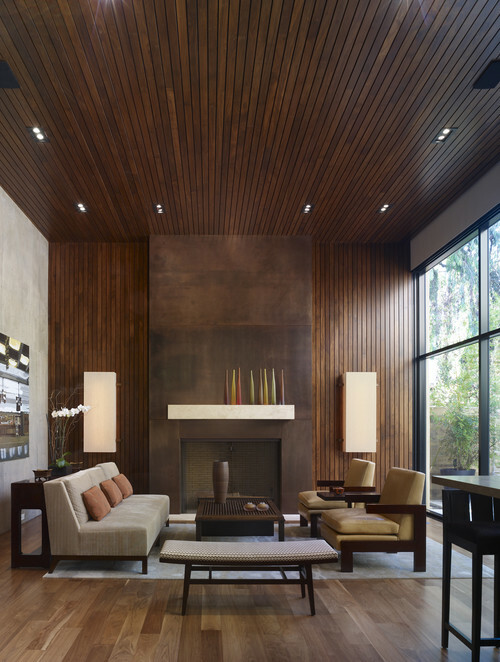 An easier and more exciting approach is to mix wood tones in your decor to provide a more layered, interesting room. You can mix tones with confidence it you stick to a few basic guidelines. When choosing furniture you have to consider your floors if they are wood. They are the constant against which all other wood tones will be compared. If your floor has more that one colour you can safely choose any of those colours for other wooden furniture or accessories. 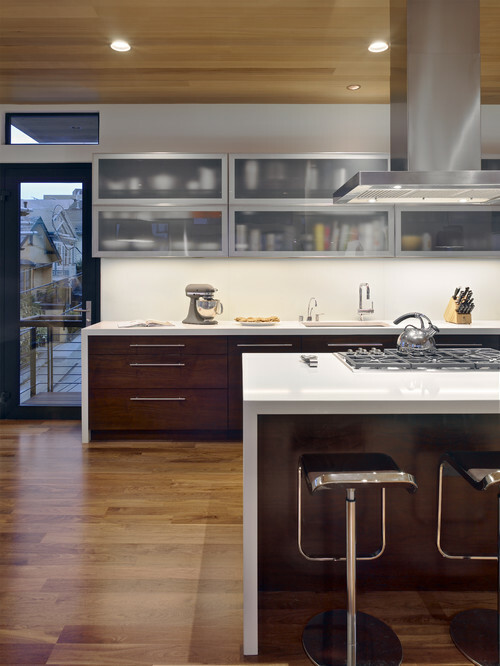 Generally, it’s best to limit the number of wood tones to two or three per room. In the room above only two wood tones are used. Hints of the darker tone can be found in the floor and this creates a very harmonious look. There is also good contrast between the floor and darker cabinets.That's important. Choose one tone as the "star"
If you have various wood tones or are buying new furniture, choose one of the wood tones as the dominant one. Aim for uneven proportions. The room above is a very interesting balance of lights and darks. 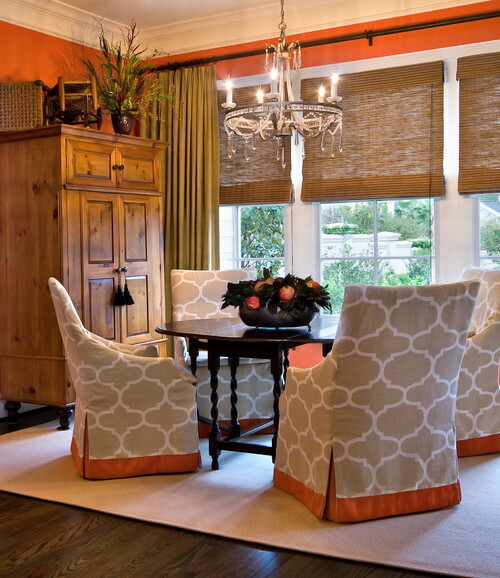 When the rug and chairs are included in the mix it's the cabinet that stands out the most. The dark floor is acting as a backdrop. Sometimes you end up with all the same wood tones in a room and the only way to bring some variety is to separate the wood tones with an area rug so everything doesn't blend together. This also works when you have two different tones that don't work that well together. Separation breaks the comparison. A close viewing of this room shows light, medium and dark wood tones which have been connected by spreading them around the room. The dark table connects with the upholstery piece at the foot of the bed. The armoire, legs and mirror are mid to darkish and the floor is light providing good flow and contrast. If you choose dark tones for bookshelves banking a fireplace you need to have other dark tones around the room, preferably on the opposite side to move your eye through the room. Deep, dark, rich wood tones such as mahogany, cherry, and walnut will often go better with medium-toned woods than lighter ones. And likewise, lighter toned woods, such as pine and oak, will also go better with medium wood tones, rather than with dark. In other words, it is okay to use varying wood tones, but aim for a lower level of contrast. The room above has medium and dark wood tones. All the wood tones in this furniture are medium but they do not match perfectly. When you keep your major furniture pieces in the same wood tone, you can bring in other tones through accessories. Wood frames, candlesticks, trays, sculpture, or vases are obvious choices. Every wood has a colour temperature that needs to be considered. Natural ash, birch and maple tend to be cooler while other woods like oak and pine tend to be very warm with undertones of orange or yellow as they age. Some stained woods can show warm and cool tones at the same time. This is ideal because then you can mix and match the wood tones in the space. When I'm choosing flooring for a client I look for finishes that will allow me to mix both warm and cool tones.In the room above the floor actually has more warms than the shot displays. If you have one piece of furniutre that is a different wood tone, you can use paint, window treatments or upholstery to mimic the wood tone and spread the colour around the room. The blinds and cabinet work together. Most of us have wood tones somewhere in our homes and any renovations usually bring this issue to the forefront. I would love to hear how you have dealt with the making wood tones work in your space. thank you for this article. I have floors with both light and dark tones and, to date, have walnut furniture... side tables, china cabinet... all are antiques. I'm looking at an antique oak dining set and wondering how well it will go with walnut. Any thoughts? Having floors with several tones makes it possible to introduce several wood tones in a space successfully. If you feel the antique oak stands out too much from what you already have, why not add two more small items to the room that have the same tone or use some pillows that introduce that undertone (yellow/orange if it is antique oak). Because walnut is usually quite dark and doesn't lean to warmish undertones tones it a good wood for mixing with other woods. I am suggesting this without any pictures of your place. Hope this helps. Great article! I have an heirloom piano in a mahogany(? reddish) finish. It's impossible to find coordinating finishes in today's furniture, so in the past I have chosen pieces with a black painted finish. I am considering replacing all the room's furniture EXCEPT the piano and starting fresh. My idea is to find pieces with a white painted finish to freshen up and lighten the feel of the room. However, I am concerned about how well the white and the mahogany will mix. Any thoughts? Tiffany, White works with most everything. I would be more inclined to choose a softer white rather than a stark one. When we built our house 20 years ago we had all the doors, trims,staircases and window frames in a dark reddish coloured hardwood mahogany and subsequently had all the furnishings to match accordingly. My wife sees this style as being dated and wants to revamp the house with a modern look using light coloured oak firniture and flooring. The problem she has is that she is adamant that the dark wood would clash with the new decor and wants to paint it all or tear it out and fit new, whereas I think if the right furnishings are choosen it will give contrast to the rooms and still give her that modern look she wants.Is it possible to mix and match different woods . Any advice on how to make the mahogany work for us would be very much appreciated as my wife is considering the option of buying a new house! There is always an economical solution for most decorating problems. I feel strongly that you can mix woods successfully. If you have lighter, more neutral oak, maple or birch flooring, you could still make the darker trims work and furniture work by bringing the undertone of the trim colour into your decor with accessories (pillows, art etc. ). Of course painting out the trim is the most obvious solution for a change and perhaps that is all you need to do to update your space. We had stained oak trim, railings and floors. I kept the floors and railings and painted out the trim only. It totally updated the space with very little cost. You could also could also consider lighter furniture and keep the floors and trim the same colour. Just be assured that all your wood tones do not have to be the same and in fact it is pretty boring when they are. Finding the right balance is key. Perhaps there is a new post in your question. My husband and I have just built a small addition to house a new master bedroom. We have chosen red oak flooring to match the flooring in the rest of the house which is a 1950s post World War II style ranch. The new bedroom will have a L shaped window seat, built in bookshelves, and a built in wardrobe. I have a cherry wood dresser that will also be coming into the bedroom. 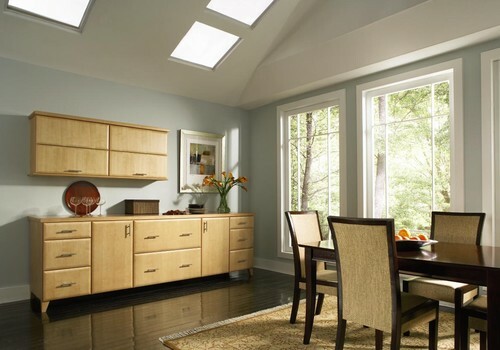 We need to decide what type of wood to use for the bookshelves, window seat and wardrobe; what type of wood to use for the window trim; and what type of wood to use for the underside of the soffit that is over the window seat. My husband is thinking about using fir for the trim and cherry (which would match my dresser) for the various built ins. I am concerned that between the red oak, cherry, and fir, there will be too much contrast. I would prefer the overall feel of the room to be medium to light. My initial reaction to your question is to paint your trim and built ins a soft white. You don't mention what the trim is in the rest of your home. It should be consistent. If you want wood stained, I wouldn't add in a third wood (fir). Usually with wood trims you stick to the same wood as the floor (eg. At one time I had oak trim and floors). Hope this helps. I would stay away from anything that has a yellow or orange undertone since that is what you will have in the oak. I quite like grayed greens and green blues with oak. Grays/ taupes also work well . I like Benjamin Moore Smokey Taupe, Ranchwood and Revere Pewter. In a small space I would work with something lighter for walls and countertop. It is very difficult to make a recommendation when you have not seen a space. I would love your thoughts on this challenge I have. We purchased a 1986 2 story 4 Br house that needs a total interior face lift. The house has the darker stained oak wood work,6 panel oak doors in all rooms that is in good condition. The realtor suggested we rip out all the wood trim and doors and replace it with a Hickory color. The cost just to do the doors would be $4200.00 not including any base,or trim,or installation charges.The house has a beautiful centered wood staircase off the front entry, that would need to be changed also $$$. I would like to try and change out the hardware on the doors to a newer color and style. Next I'm wondering if I changed out the base trim in all the rooms to a White baseboard trim that's wider 3 to 4 inches. Maybe giving the rooms a way to introduce more color into the space. I can't see why we can't work with the current dark wood color, I'd touch up all the doors and trim as needed and clear coat with a satin polyurethane. We will be doing all new floors in the whole house, new kitchen top to bottom, and new bathrooms. I can't see why we can't work with the current wood color. We will be doing all new flooring in the whole house, new kitchen top to bottom, and new bathrooms. My paint thoughts are walls soft cream tone and formal dining room in soft taupe. The house currently is a rainbow of colors, pink,blue,yellow bedrooms and Mauve formal living room and dining room, the kitchen is a mustard shade. I think the only room recently painted was the great room,as the original owners were elderly and hadn't done much. Do you think we would recoup the estimated cost of probably $8000.00 to change the wood work? Were planning on selling the house as soon as we finish the renovation. The home is in a great area priced in the 350 to 400 price range when completed. I could send you photo's soon we close in 3 weeks. I guess one thought is try one bedroom my way and have the realtor back for a look see. Several thoughts come to mind in reference to your questions Deanna. I don't think you would recoup the cost of changing out the wood trim if it will cost $8000.00. I would either keep the trim consistently dark (including the baseboards) or paint all of it out white. I know that is heresy to most people (my husband is one of them), but it really lightens and brightens a space and brings more continuity to it. So much of resale value is determined by your area and what is considered " in style". Where I live stained wood trim would be considered a detriment as most everyone is looking for wide painted trim. Dark wood trim breaks up a space. If your home is a Craftsman design, stained wood trim is consistent with the design aesthetic of this period style. I definitely would not advise having painted baseboards and everything else stained. I would spend the money on updating all the door hardware and keep it consistent throughout your home. Keeping your colours neutral and lighter is a good bet for resale. Watch the taupe colour if you are keeping the stained trim. People often don't consider stain having a colour but it does all have an undertone that can work against wall colours. If you have a paint shop in your area that has a decorator on site to help customers with paint selections, check them out. You would need a sample of your stain colour on a piece of wood. Choose your floors carefully and make sure they work with your stain colour undertone. Thank you Margaret for this nice article. I have a question about my dining room. We have a large table that is black-brown stained pine. We are planning to have storage for both books & dining ware in the dining room. So my question is: how can we add storage without overcrowding the room that isn't big, by choosing colors that won't make the room look small? I was thinking about having the same wood color (black- brown) & hanging the wall cabinets behind the table, but when I read your article I got confused about the black-brown color. By the way we have birch wood in the adjacent living room & both rooms are painted in light Peach & have white trimming. If you have an option keep the wood tones the same. That alone will help bring visual flow to a smaller space. If some of the shelves are open you need to make sure you have an orderly presentation of objects- not too much clutter! Having colour flow from the room next to the dining room will also help. Limit the furniture in the dining room to what you absolutely must have and get rid of the rest. Also think about colour flow in you have fabric covered chairs. i am currently renovating my kitchen area which is a completely separate room to the rest of the house. At the moment i have a dark walnut floor in the house and in the kitchen i am considering a completely different colour floor. Is this ok??? Im also quiet overwhelmed as the kitchen island front is an "America Oak Aged Smocked and Limed wood" Im just not sure what tone of wood to do the floors. We currently have a mahogany fireplace with cream marble back and hearth. furniture. My question is will this look ok with the mahogany fireplace or should we change this to either oak or maybe paint it cream.Many thanks Brenda. Given a choice I always opt to painting our wood around a fireplace because I see it as "trim" as your facings and baseboards are trim. You can do it your trim colour or match to the cream in the marble. My daughter just bought a new house. The kitchen cabinets are a honey oak but the trim around the house and stair railing is more of a darker red tone stain. So we are wondering what color stain should go on all the door and door frames? Remember the trim is more a darker red tone. And also what color kitchen flooring would go well. She would like to do a wood, maybe pergo. Keep your trim and door colour consistent if you are staining or paint all trim and doors in a light colour. Red toned stain does not sound like it will work well with honey oak but it is so difficult to know when you are describing things in words. This seems to be a very popular topic and I've gotten just as many email questions as those posted. I am closing responses to individual questions from responders. It is very difficult to answer any questions without visual information and when you get to that level it is considered a consultation. I will gladly supply rates for those interested in an online consult. Our kitchen cabinets are light natural hickey wood, and our dining room set, and a custom made fish aquarium is medium toned oak. We have a small home, and the kitchen is open to the dining room, so the cabinets and dining room table are close together. How can I make the rooms look good together? We live in an older home with lots of woodwork stained a dark walnut, restaining is not an option! We are remodeling the bathroom, and the door to the bathroom is the dark walnut color. My question is do we match up the vanity in the bathroom to match the door? Would it work to go lighter, maybe a hickory? You can have painted trim and wood doors. Just keep all the doors in the space the sane. Choose a stain with the same undertone as the floor, but it can be lighter or darker. I am refinishing and staining the wooden floor on the main level of my house, the staircase and the hand rails. I was wondering about contrasting the staircase against the wooden floor, eg. staining the wooden floor with Dark Walnut and staining the staircase and the hand rails with Ebony. Do you think it will work? Or, should I use the same stain color for the floor and the staircase? I'll greatly appreciate your suggestions. Thanks. I like the idea of going darker with the railing. Every line of stain has its own version of standard colours. Check each colour on a piece of wood to make sure the tones are compatible. Without actually seeing the flooring, I would predict that the tones would worl out fine and tight matching is one of the ways to go. Personally I find that approach a bit too much of the same colour. I prefer to choose a flooring with the same undertone and a little darker than furniture or trim. As for off white walls, they would work if you got the undertone right with your woof. I would stay away from creamy yellowish off white. It's so difficult to advise without being there! I don't know if my first post was received. Have a black walnut grand piano in my living room. Want to purchase a small table for music books. the other furniture in the room is oak (honey/golden). Table options are cherry and oak (tan). Would either work? I would choose a table in oak darker than the tones you have or one the same as your piano. Definitely not cherry. My top choice would be black walnut. Thank you! Unfortunately, there are only the two wood options for the table I found online. I will continue my search. I'm so happy that I found your website. You offer so many practical, helpful suggestions. If you have white trim in the room, I would choose white and stay away from a wood tone. very nice mixing wood tones... inspiring me.. Your article is very motivational thank You!